William Arthur West was born in 1863 in Guildford. I became aware of him through the his marriage to my Grandfather’s Aunt – Emma Jane Ellis (Harris). They married in 1897 and raised two children. A son called William James born 1898 in Aldershot Hampshire and a daughter, Clara Edith born 1901 in Aldershot. I commemorated William James in yesterday’s post. This photo was taken during the Boer War. 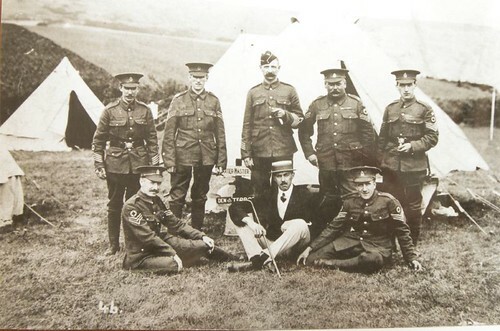 William was already in the Army, serving in the Medical Corp by the time of the Boer War. He joined in 1878 and spent time abroad during the Zulu Wars and the Afghan Wars. 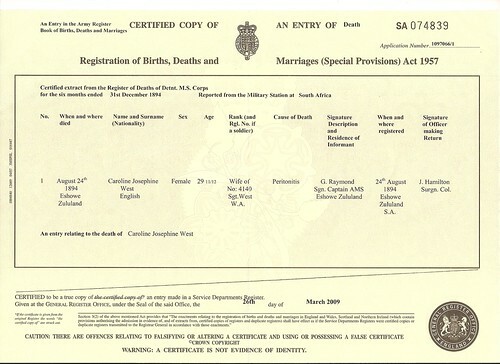 His wife accompanied him and died in Zululand in 1894 and her death certificate is below. He remarried to his Cousin in 1897 and they subsequently had two children, as I mentioned above. I love the sign “Den of Terror”! By chance I did a Google search on William Arthur. I have never come across anyone researching this family outside of my immediate family so what happened to William and Clara. I also wanted to know more of William Senior. I did know that after leaving the military he owned a sweet shop in Stony Stratford, Buckinghamshire. This entry was posted in Uncategorized and tagged Ellis, Genealogy, Harris, Remembrance Day Photo Collage Festival, West. Bookmark the permalink. Dear Julie – a big thank you for all your comments on my contributions to your Remembrance Day Challenge. I do think it so important that we remember those who died plus those who served and survived, and I am proud to make my own tribute. It is often difficult to come up with slightly different way of doing this each year, so . I am so pleased to tale part in your challenge. . . It was lovely Sue and such as shame that the data is no longer online. I do though have an identical copy of the material in that original archive. I was delighted that there was such interest in William by the local rotary club in Stony Stratford where William lived with Emma. It was that collection of documents that put me onto to a first wife, who died in South Africa. The Rotary club had strong links with a local village, where William's first wife is buried, so I gave them a donation in William's memory to help towards the current project, which I seem to recall was building a school building. A wonderful research story – not only to have photographs from the Boer War, but also to get such a response from a random Google search. You must have been delighted to see the archive on William. . I love the photo Julie, but I love the story of the researcher's generosity even more! That was really quite remarkable. What a pleasure and a privilege. You never do know what's out there unless you go hunting. Well done!